Polo Double Black Cologne is a notably attractive and beguiling fragrance. It is especially awesome if you like refreshing oriental scents. Despite the name, Polo Double Black Cologne is not black or heavy at all. In fact, it is almost the contrary. It is somehow light and rejuvenating at first. Then, it transforms into such a soothing warm scent that is very pleasant and comforting. The ingredients used are actually not that complex. Polo Double Black Cologne only uses a handful of ingredients, but it has managed to combine them all in such a compelling manner. It is an awesome, elegant fragrance suitable for the fall and winter times of the year. Actually, Polo Double Black Cologne is not the first product that comes in an all-black theme from the brand. It is actually an improvised version of an older fragrance, namely Polo Black. Compared to the original Polo Black, Polo Double Black Cologne is seemingly made to be bolder, as indicated by both the name and the darker black hue of the packaging. Still, regardless of the color, Polo Double Black Cologne is actually not a dark or heavy fragrance. While the original Polo Black was released back then in 2005, Polo Double Black Cologne was released for the first time into the market only a year later in 2006. The perfumer who designed and crafted this fragrance is Ellen Molner. 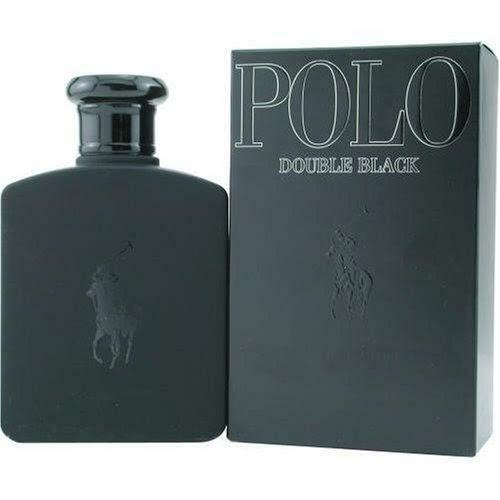 Polo Double Black Cologne is produced by the Ralph Lauren company under the Polo line of products. Polo Double Black Cologne comes in a black box. The box is rather plain and simple in appearance. The whole thing is colored in a pitch black hue, whereas the Polo Double Black name and the brand logo are embossed on the front side of the box. You may not notice the brand logo if you don’t look at it closely. Inside the box, you will find another black object, this time a pitch-black flacon. The shape of the flacon is almost rectangular. The brand logo is also embossed on the front side of the flacon, now more clearly and easier to be seen. Unfortunately, the flacon is not translucent. You may not be able to see the amount of the remaining liquid inside. But, in general, the packaging of Polo Double Black Cologne looks elegant and alluring with the mysterious black theme. Polo Double Black Cologne has a very unique scent. It is not dark or heavy. It is actually refreshing, soothing, and pleasant. It starts with a refreshing opening, but then transforms into a warm, comforting scent. Polo Double Black Cologne opens with the top notes of frozen mango and pepper. Together, the combination of frozen mango and pepper is very nice. It is fresh, yet with some spiciness around. After some time, it starts to unfold the heart and base notes. The heart notes introduce nutmeg and coffee. Both woodsy and coffee smells always have a calming, comforting effect to people. The base notes further enhance this effect with more woodsy notes and cardamom, while some juniper berries give some remainder of the fresh spicy opening. The sillage of this fragrance is pretty moderate. It only radiates within an arm’s reach. The longevity, though, is decent and reliable, as it can last for about three hours. Check the best price of Polo Double Black Cologne here!